The Central Public Library of Rethymnon is one of the largest in Greece and the only public library in Crete. The library is equipped with two mobile libraries which bring books to even the most remote and isolated villages in Crete. In the 60 years of operation, the Public Library of Rethymnon has flourished. Today the collection reaches 200,000 volumes of books, 10,000 volumes of periodicals, as well as a rich archive of local and Athenian newspapers. 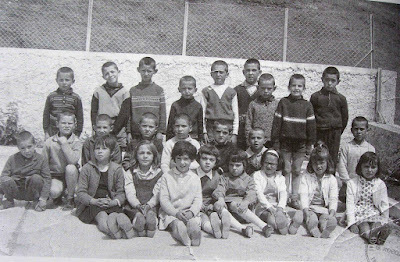 "Pupils of village school in Omvriaki Domokos (Greece) in 1967"
This photograph was brought to my attention by a post made by Alexandros La"i"nas on the Facebook Group - "Old Photographs from Greece"
"Primary School in Chios in the mid 30s"
This photograph was brought to my attention by a post made by Alexia Kardasilari on the Facebook Group - "Old Photographs from Greece"
The announcement has been made. The Greek-American Historical Museum of Washington State has just launched its latest effort at preservation. This is its “museum without walls” initiative. Greek-Canadians gifted the bronze sculpture honoring Hellenism by artist and professor at the School of Fine Arts Athens, Giorgos Houliaras, for the 375th anniversary of Montreal. This story has been covered by TheNationalHerald.com , TheGreekReporter.com , among others. Website: http://www.vivltri.gr/?page_id=23 - Allows you to download an Excel spreadsheet that lets you search or browse through all the books in their collection. Noteworthy: Tiniest Greek Orthodox "communities" just about anywhere. McGill is where Greek Orthodox presence in Nevada began. "Perhaps the word "communities" might be stretching it quite a bit, considering that the entire Greek Orthodox population of this remote area in east-central Nevada could fit in one long pew of a typical church. "Many years ago, however, the communities of Ely and McGill were vibrant parishes with several hundred members. . . .
"The two communities are the easternmost of the San Francisco Metropolis. May 22, 2017 Ancestry.com added a new database titled Montana, County Naturalization Records, 1867-1970 that contains 931 people recorded as having been born in Greece. Vasilios Anagnostopoulos was born on January 11, 1888 in the small village of Steno, located near Tripoli in the Peloponnese. He was the eldest of six children, followed by Charalambos, Christiana, Andriana, Georgia and Nicoletta. Like many of his generation, he was destined to travel far. While he was still a teenager, he was to change the economic and even cultural circumstances of northeastern Michigan. Sad to say, however, much too much of Greek American history is lost forever. The PUBLIC CENTRAL LIBRARY OF PYRGOS is located in the Regional Unit of Elis, West Greece.